Technically, this is a costume that Dean made him wear, but since it COULD be worn in present day, I’m including it in the inventory. This is a very white shirt with yellow and blue embroidered flowers on the shoulders. It does up with silver snaps. 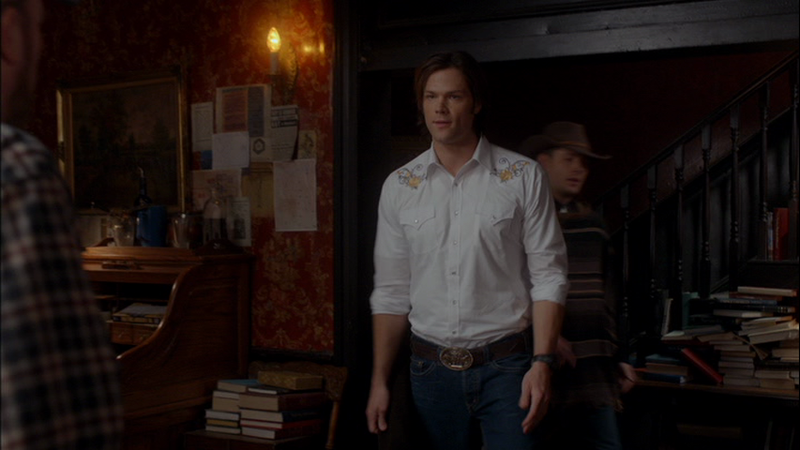 Sam wears it to 1861 in Frontierland (6x18), he keeps it on the entire time they are in the past, and is still wearing it when they return to the present and Sam gets the package from Colt. FATE: Although it survived the episode, Sam thought he looked stupid wearing it, so I doubt we'll ever see it again.